This Church located in Barcelona, Spain is a UNESCO World Heritage Site. It is a Roman Catholic Church planned by architect Antoni Gaudí and its construction began in 1882. However, it remains incomplete until today. This is mainly because of its gigantic size which means that in the time taken to complete building the original plan, the earliest construction would need to be renovated and this process would never end. We have also covered about largest Hindu temples around the world. It is estimated that a tour of the whole church would take about a week. The Gaudi’s work was mostly inspired by nature and evidence can be seen in the columns inside the Sagrada Familia that are built to look like trees with twisting branches. There is a turtle at the base and another one is the tortoise which symbolizes the balance between sea and land in nature. The mosaic located at the roof of the church was well designed to guide seamen back home by reflecting the moonlight and hence turning it into a kind of lighthouse. This famous church is located in Moscow, the capital of Russia and marks the exact centre of the city. It was completed in 1561 under the reign of Ivan the Terrible and has a very colourful architecture unusual for a church. Like the Sagrada Familia, it is a UNESCO World Heritage Site and is perhaps one of the most famous Churches in the world because it appears in many movies. We have also listed beautiful castles Built Around the World. One of the most famous churches, Saint Basil’s Cathedral consists of nine chapels built on a single foundation and interior is a maze of galleries winding from the chapel to chapel equipped with narrow stairways and low arches. The wall was decorated with floral and geometric patterns. The colour and shape of the Saint Basil’s Cathedral are truly amazing and unmatched across the globe. The Saint Basil the Blessed can be visited in his chapel on the lower floor where he is placed in the silver casket in gaudy splendour. This church, also called the Notre Dame Cathedral is located in central Paris and was built over more than a century in the medieval period. The architecture of the church reflects the traditional medieval style in the form of columns, spires, and statuary. It is one of the major tourist attractions of France and continues to inspire artists and architects. History has many symbols, here are a few beautiful castles built around the world. The cathedral was built between 1163 and 1345 and listed as one of the largest religious buildings in the world. One of the famous churches in the world was designed in Gothic fashion with its twin towers go as high as 69 meters and have 387 steps. It has numerous statues outside walls of Notre Dame and interior of the church looks astonishing. The south tower of the church is home to Notre Dame’s largest bell that weighs around 13 tons and popularly known as the Emmanuel Bell. This Roman Catholic Church is the seat of Papal power and is located in Vatican City, an enclave in Italy. This church was designed at the height of the Renaissance by the famous artist Michelangelo and has the tallest dome in the world measuring more than 136 meters. It has become the most famous church in the Vatican and one of the most popular tourist sites in Europe. This is the largest church in the world with an internal area of 15160 square meters that stretches over 186 meters in length. The largest Basilica of Christianity has a capacity of 60,000 people and there are many architects who have worked on the design of one of the most famous churches in the world that includes Donato Bramante, Raphael, Antonio da Sangallo the Younger, Michelangelo, Jacopo Barozzi da Vignola, Giacomo della Porta, Carlo Maderno, and Gian Lorenzo Bernini. One of the finest examples of Renaissance architecture is considered to be the holiest Catholic shrines and “greatest of all churches of Christendom”. This famous church is situated in London and is one of the iconic buildings in the country. It was built in the 10th century and today is a UNESCO World Heritage Site. The Thames River and Westminster Palace are both located near the Abbey and the Gothic architecture draws many tourists each year. The Westminster Abbey is also the place for the burial and coronation of the royal family and national heroes so have special significance as a structure of national importance. The Gothic abbey church in the City of Westminster officially known as the Collegiate Church of St Peter at Westminster. The construction has been started by Henry III in 1245 and later declared as one of the most important Gothic buildings in the country. Later, the church has been expanded by the Chapel of Henry VII was added between 1503 and 1512. It has two western towers were built between 1722 and 1745 by Nicholas Hawksmoor and it was constructed from the Portland stone to an early example of a Gothic Revival design. The next famous church is also located in London, on top of a hill – the highest point in London. It is the seat of the Bishop of the Church of England. The church in its current form was built in the 17th century through its predecessor, the earlier St. Paul’s Cathedral was built in 604 AD. One of the oldest and famous churches in England, St Paul’s Cathedral has one of the largest domes in the world. It measures around 112m and has numerous steps in it. The most visited area of teh church is its whispering gallery that has an astonishing avant-garde design. The artist’s masterpiece has many pieces of artworks that are dated back to the Victorian Era to modern day works. The iconic building is a source of inspiration for many movies that include Harry Potter, Sherlock Holmes and Thor. This Basilica is located in Bethlehem, Palestine and is believed to be the birthplace of Jesus. One of the Famous Churches around the world. Its construction was started by Constantine in 327AD and today it is UNESCO World Heritage Site. This church, however, does not see many tourists because of the ongoing conflict in Palestine, but some believe the truly devout worshippers are protected from all danger by divine power. The basilica was completed by the Roman emperor, Constantine in 333, however, the church was destroyed in a Samaritan revolt in 529 and rebuilt in 565. There is a small door of Humility that stands at the entrance to the basilica and it forces people to bend over while passing through the door. The structure of the site is a combination of two churches and a crypt beneath. This church is also called the Church of Resurrection because it is believed to have been built on the land where Jesus was crucified and then resurrected. It is located in the Old City within Jerusalem in Israel and was built by the first generation of Christians in the world. It is one of the holiest sites for Christians and has been worshipped since the 4th century. Additionally known as Church of the Resurrection or Church of the Anastasis it contains two holiest sites in Christianity, one site where Jesus of Nazareth was crucified known as “Calvary” in Latin and “Golgotha” in Greek and the other one is Jesus’s empty tomb where he is said to have been buried and resurrected. This church was constructed in 1650 in Venice, Italy and is the most famous church in Venice. It is an example of Byzantine architecture. The first church located at this site was commissioned in 832 AD and has been rebuilt many times since then. Due to its striking architectural style, it draws many tourists. One of the most famous churches of Venice and the finest example of Italo-Byzantine architecture officially known as the Basilica Cattedrale Patriarcale di San Marco and commonly famous among people as Saint Mark’s Basilica is the cathedral church of the Roman Catholic Archdiocese of Venice, northern Italy. It was burned down in 976 during an uprising, however, it was restored under his successor named Doge Domenico Contarini and the present basilica was completed in 1071. The Hagia Sophia has, through the years been a Greek Orthodox Church, a Roman Catholic Church, a Mosque and is currently a national museum. It is also one of the Famous Churches around the world. Its construction started in 537, but it was completed after about nine hundred years in 1453. Until today, its engineering and architecture are considered a major achievement. The building was converted into a museum and opened in 1935 and located in Istanbul, it overlooks the crossing between the continents of Asia and Europe. The church is a Roman Catholic church built within the salt mines approximately 200 meters underground in the halite mountain near the town of Zipaquira located in the Cundinamarca, Colombia. It is one of the most visited tourist destination and place of pilgrimage in the country. Inside, you can see the temple at the bottom has three sections namely, birth, life, and death of Jesus. It is one of the most notable achievements of Colombian architecture and hence one of the famous churches in the world. The church receives a good amount of tourists, especially on Sunday. 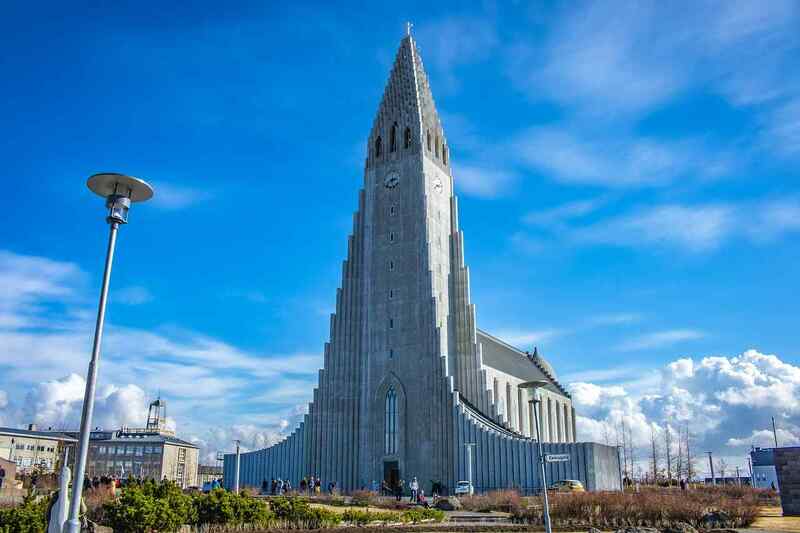 One of the famous churches in the world is also the tallest building in the Reykjavík and the sixth tallest structure in the country. The church built at a height of 74.5 meters tall. The church was designed by the State Architect of Iceland, Guðjón Samuelsson in the year 1937 and built in the honour of Hallgrímur Pétursson, He is one of the best-known poets of Iceland. Because of the war, the construction was delayed that began in 1945. The design of the church was inspired by the Icelandic beauty of nature. The popular name is Holy Trinity Church situated near the village of Gergeti in Georgia. It was located right near the river Chkheri at an elevation of 2170 meters under Mount Kazbegi. The Church was built in the 14th century and it is the only cross-cupola church in Khevi province. One of the famous churches in the world because of its isolated location situated on the steep mountain and surrounded by the beautiful landscape of nature. The church is a popular waypoint for the travellers, mainly trekkers and it can be reached d by a steep 1 1/2 hour climb up the mountain or with the help of a jeep. One of the most impressive and famous churches in the world situated in the Piazza del Duomo. The fifth largest Christian church in the world by passing Outdone by St. Peter’s Basilica in Rome, the Basilica of Our Lady of Aparecida in Brazil, Cathedral of St. John the Divine in New York and Seville’s Cathedral. It covers a surface of 109,641 square feet and considered as one of the oldest churches in the world. There are about 3,400 statues, 135 gargoyles and 700 figures that decorate one of the famous churches in the world. The church is one of the most popular landmarks to tour in London is Westminster Abbey. It was formed by the Benedictine monks during the tenth century and hence establishing a tradition of daily worship. The current Westminster Abbey was started by the Henry III in 1245 and considered as one of the most important Gothic buildings of the country. Officially known as Westminster Abbey is the Collegiate Church of St Peter at Westminster. It has been the coronation church for the British Monarch since 1066. These symbols of Christianity have today grown to have significance beyond the religious. They are major tourist attractions for people from all parts of the world and from all religions and are also symbols of national pride. Today, they are studied for their historical, architectural, cultural and religious importance and are testaments to the creative feats human beings can achieve. Thes are the famous churches in the world. Do post your comments.